Five-star safety harder on cheaper cars | What Car? Nissan's new Micra supermini is due to go on sale in November, but don't expect the car to have a top five-star Euro NCAP crash test rating. The new Micra has been developed to be made and sold in emerging economies -production centres have been shifted from the UK and Japan to China, India, Mexico and Thailand and its emphasis will be on simplicity, functionality and low production and running costs. However, Euro NCAP changed its crash safety scoring system for 2010, making it harder to score the maximum five stars for example, five-star cars now have to have stability control fitted to the majority of its versions. This could make it harder for cheaper cars to achieve the top ratings. Vincent Cobee, project director on the new Nissan Micra said: 'We want to be competitive on safety, but to achieve the new five-star rating becomes outrageous. The current version of the Micra has a four-star Euro NCAP rating. 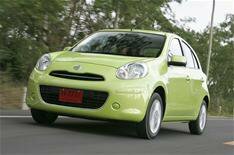 Cobee said the new Micra will still appeal to European customers.